In a previous article, we talked about the importance of your author mailing list as it pertains to your outreach and promotional efforts. While social media sites may come and go, your author mailing list will always be under your control. 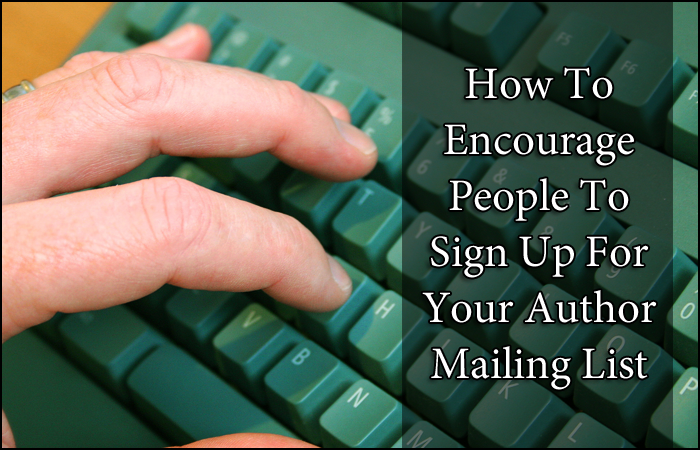 So how can you convince visitors who come to your author website to sign up for your mailing list—especially if they’re already your fan on Facebook or your follower on Twitter? Here are a few fantastic ideas that will help you move people into your mailing list, which can turn casual visitors into dedicated fans. Post Your Sign-Up Form In An Obvious Place. This may seem like a no-brainer, but if you hide your mailing list, people will be less inclined to sign up. Ideally, you want readers to be able to join your list in as few clicks as possible. Put A Link To Your Sign-Up Form In Your Email Signature Line. Consider adding a note in your email signature line that says: Want to stay in touch with me? Sign up for my mailing list! Then, include an appropriate link. Have Your “Contact Me” Form Automatically Add People To Your Mailing List. When readers write to you using the contact form on your author website, you can have their email addresses automatically added to your mailing list. Just be sure that it’s clearly posted that you’re doing this. Otherwise, visitors may get annoyed when they discover they’ve been added to your list. Do not violate anti-spam rules from your mailing list provider. Offer Them Something They Want. Why not entice visitors to sign up for email updates by offering people who join an exclusive digital version of something you’ve written? This can be a free e-book, a short personal essay, or a handful of poems. While you certainly can take the technical route of uploading an e-book to an online retailer, another possibility is to create an auto-response email that is immediately sent to anyone who signs up for the mailing list. The email should contain a link to a PDF file of your online offering. Note: Your e-book might not be especially secure if the link to the PDF gets around to readers who did not sign up for your mailing list. However, this can be a good and simple way to start. Consider Tasteful Pop-Ups On Specific Pages. Few people love pop-ups. That said, they are unmatched in terms of effectiveness. Consider creating a pop-up on your website that will appear to visitors just once when they visit specific pages. Moderation matters. Host Contests On Your Social Media Sites That Drive Fans To Sign Up For Your Mailing List. Create a form directly on your author website. Then let friends on your social networks know that in order to enter your contest, they must fill out the form on your website. Just be sure to let contestants know that their email addresses and/or mailing addresses will be added to your mailing list. Host An Ongoing “One Random Fan Wins Every Month” Contest. If you proclaim on your website that one random fan on your mailing list will receive a certain kind of prize every month, then readers may be more inclined to sign up—not only because they want a cool prize, but because you’ve drawn their attention to your mailing list in an exciting way. Don’t Underestimate The Power Of Friends And Family. Ask your friends and family to sign up for your mailing list. Then, ask them to ask their friends. Writers, self-promotion is okay! Once you’ve built a fantastic mailing list, your next step is to keep your readers motivated and in sync with you. For more information, check out our article on how to stay in touch with your mailing list subscribers. QUESTION: What makes you want to sign up for mailing list?